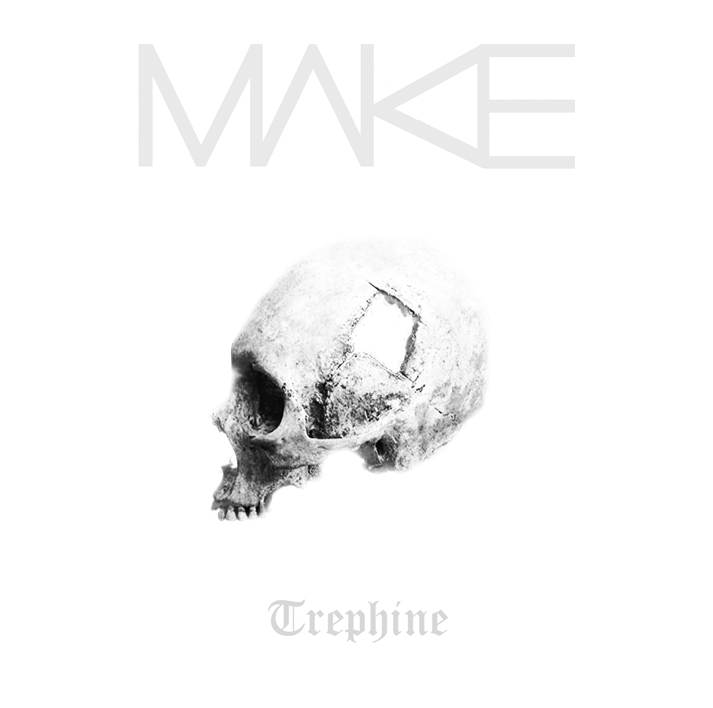 Originally self-released digitally and on CD in March of this year, Trephine by Chapel Hill’s MAKE is now available via Devouter Records as of this Monday (30 July). As you’re surely aware, a trephine is a special type of saw used to cut a hole in the skull, allowing a brain surgeon access to operate. Similarly, the album Trephine will enter your head, forcing its way deep into the recesses of your mind, but there’ll be no anesthæsia here; you’ll be fully aware the whole time, to witness the journey down to the darkest depths of your psyche. Once things get under way, (opening track “Ancient Tongues” begins with about a minute of some sort of distant, staticky, grinding noise), it feels like we’re going to get into some black metal. The sound of the guitars and the overall atmosphere definitely give that impression, and especially when the harsh snarled vocals enter. That drum part, though, is very atypical of a black metal style. Not too far from a standard rock beat, so I might be tempted to say black ‘n roll (or, considering that there are some more death/melodeath-sounding guitar leads and riffs, perhaps blackened death ‘n roll?). But there’s more to it, though. Mostly it’s the constant ding! of the bell of one of the cymbals that seems to drive the rhythm, but something about the pattern here seems hypnotic — producing an effect similar to the beat in trance or D&B music. This is far more organic-sounding, of course, but trance-like or hypnotic would be the best way for me to describe it. A similar style of drumming permeates many of the tracks here: the somewhat sludgier, heavier, and murkier sound of “Returning to the Ruins of My Birthplace…” tempts me to describe the song as sludge ‘n roll (or perhaps blackened sludge ‘n roll, since after about three minutes without vocals, they enter as an anguished scream, then continue as blackened rasps), and although they might have less brightness in the tone, the drums remain fairly similar to the first track; “Valhalla,” with its cleaner guitar tones, intertwined with the bassline, comes across a bit more like post-metal, with a minimal, almost jazzy feel — and again the same not-quite-standard rock drumming; the first half of “Surrounded by Silent Lies” features a bit more chuggy, muted-power-chordy riffing, and the drumming a bit more intense, but still holding onto a common thread with the rest of the album — coupled with the gruff bellowing vocals, I want to refer to this as post-death-‘n-roll. At times, the record steps further into the atmospheric part of atmospheric black metal, or places more emphasis on post than on metal. “After the Dust Settles,” for example, is a very atmospheric, brief (under 3 minutes) instrumental piece, featuring an echoing guitar in foreground — with enough reverb to give the impression that it’s being played in a wide chasm. The background here starts out as faint, synthy stuff but turns staticky and ugly and eventually swallows up the second half of the track. The last minute or so of “…and Time Came Undone” is made up of shimmery instrumental echoey stuff — mostly reverby amelodic sounds, yet remaining musical rather than simply noise. Earlier in that same track, which starts out with slow, clean, post-metal/post-black/post-sludge/post-whatever intertwining guitar/bass parts, a lonely violin sound enhances the atmospheric background. Later, the song explodes back into crushing metal, with some more black raspy vocals, but again the drums are relatively slow, not resembling black or death metal — just bringing a burst of heaviness. Things alternate back and forth like that a little while, running the gamut of post-blackened-death-sludge-doom. The series of contrasting sounds comes across as entrancing in its repetitiveness, but ultimately its effect on the listener is disheartening, producing a feeling of sullenness. The last few tracks of the album really heighten the sensation of a journey inward: the second half of the previously-mentioned “Surrounded by Silent Lies” becomes somewhat grander, with a fuller arrangement, sounding space-rock-y or psychedelic (alt-psych-rock?). “Rotting Palace” follows in a similar vein; both songs feature clean singing, which is a bit reverby or trippy-sounding — but a clear and strong voice nonetheless in the former song, and as the latter proceeds the vocals sound a little weaker, or more unsure. Suddenly, though, and without any change to the music, about a minute and a half from the end, a frightening raspy-death-growl voice jumps into the mix. The slow, deliberate “Scorched Sky” continues with the death-growl rasping and roaring for about four minutes, but then dies away to silence, suddenly. Briefly, some super-reverby guitar parts fade back in (without vocals of any kind), which sets up the final track, “Into the Falling Gray.” This starts out very slow, very deliberate, with lots of shimmery and reverby guitar, and vocals that are nearly an imploring wail. More guitar layers enter, while the vocals seem to get more distant, more desolate, and more despondant. Post-atmospheric-blackened-doom-metal, and it feels like we’ve reached the bottom. After about three minutes or so, the snarled growled vocals return, which is soon followed by silence. After a little over a minute without any sounds at all, a harsh, grindy, nearly-industrial, buzzing feedback sound enters — almost entirely amusical. This noise fills the final six minutes of the album, getting (slightly) harsher and (very slightly) louder as it goes on. Mostly dominated by a sustained buzzing noise, this blend of sounds may be what it would sound like if you were locked inside a box full of stinging, biting insects. Then it just sort of ends. The exploration never really reaches anything that sounds like a conclusion or resolution — everything just basically gets overwhelmed by noise and static in the end, feeling like the whole album has been a metaphor for sinking deeper into a depressive state and then finally being overwhelmed by it. Anyone who is perhaps focused on an eventual destination, hoping to see an uplifting “they all lived happily ever after,” or to be able to draw some sort of logical conclusion at the end, may feel disappointed in that regard. However, for those who are more interested in the journey — the unexpected twists and turns along the way, and the fascinating progression through the various layers and strata as the excavation continues moving ever-downward — you will certainly find a lot to appreciate here. You can stream the album through the following Bandcamp widget. 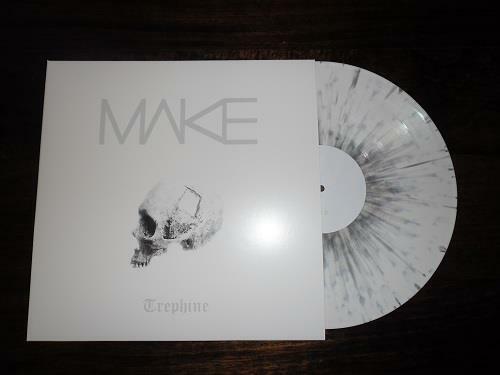 Downloads, CDs, and t-shirts are also available for purchase at the MAKE Bandcamp page. As a special treat, Devouter Records are also offering one of the album’s tracks (“…and Time Came Undone”) as a free MP3 — just click here to listen (or right-click to save). And finally, you can grab a copy of this incredible-looking record from Devouter right here (comes with a free download code). This entry was posted in Free Downloads, Free Stuff, New Releases, Reviews and tagged Chapel Hill, Devouter Records, MAKE, Matt Stevenson, North Carolina, Scott Endres, Spencer Lee, USA. Bookmark the permalink. I just got done listening to this album and I’m really impressed. I heard many bands in my head as it played; Cult of Luna, Neurosis and Morne to name a couple. Also the sound production is excellent. Songwriting is well-done. And let’s face it, if you can’t write good songs well……………………. I also hear a pretty wide variety of different things as I listen, which I think is a good thing — too many bands seem to just try to emulate the sound of another band or a specific style. Here, they seem to take a large number of influences (and it all sounds like stuff I really like, separately) and then synthesize it into something cohesive and unique.